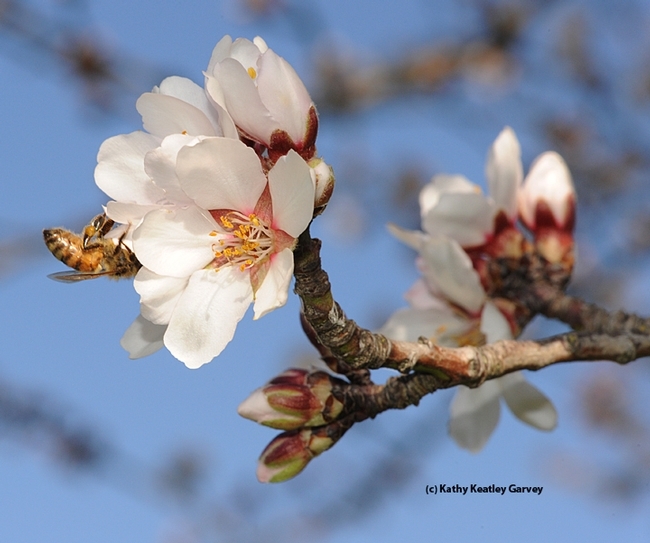 Hear the buzz in the California almond orchards? The season usually begins around Feb. 1. This year California has some 750,000 acres of almonds, and each acre requires two bee colonies to pollinate. 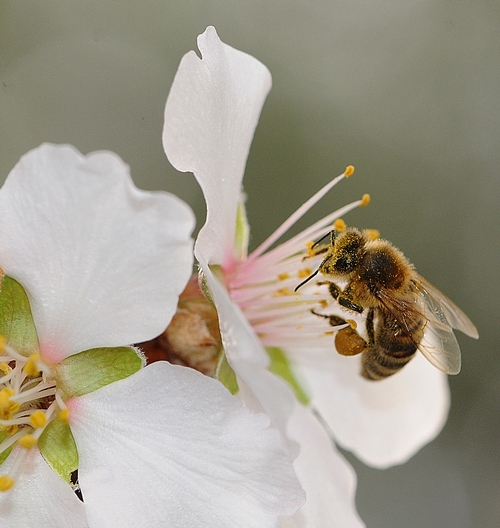 That's 1.2 million colonies needed to pollinate the almonds, according to honey bee guru Eric Mussen, Extension apiculturist with the UC Davis Department of Entomology. Since California doesn't have that many colonies--the number is around 500,000--the remainder must come from beekeepers outside the state. Christine Souza of Ag Alert, the weekly newspaper for California agriculture, wrote in the Jan. 19th edition that pollinating the state's $3.2 billion crop is not without problems: thieves steal bee hives. Beekeeper Brian Long, Madera County, reported losing 400 colonies last month, a total loss of $120,000, Souza said. It's a good idea to store hives behind enclosed and locked gates, the Ag Alert article noted, and "to give nearby property owners descriptions of your vehicles so that they can report any suspicious activity or vehicles." Perhaps those Hollywood producers looking for story ideas could take what's happening in the bee yards and film another version of "The Sting." UC Davis Cooperative Extension apiculturist Eric Mussen, a member of the UC Davis Department of Entomology faculty for 32 years, says this looks like a challenging year for almond growers. There's this water problem. Think "drought." There's this honey bee crisis. Think "bee health" and "declining bee population." Then there's these increased production costs. Think "tanked economy." Christine Souza, assistant editor of Ag Alert, published by the California Farm Bureau Federation, wrote an excellent article in the Jan. 28th edition about the problems almond growers and beekeepers alike are facing. 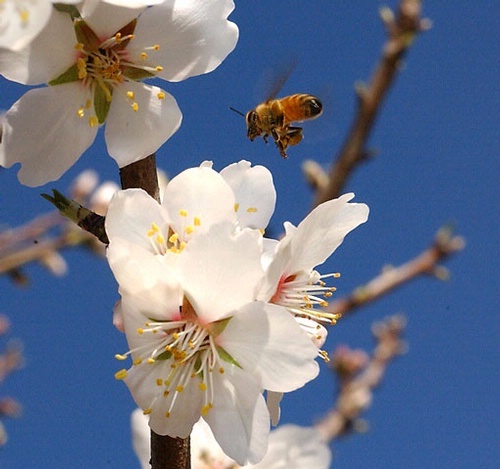 A reduction in almond prices, limited water availability, increased production costs and the declining health of bees may all influence what happens during this year's almond bloom, impacting both almond growers and beekeepers. Speaking at the Almond Board of California annual meeting last month, board member Dan Cummings warned his audience that this spring could be "dicey" for almond growers and beekeepers alike. "Bees are competing for almond growers' money the same as water, fertilizer, fuel and all of our other inputs, at a time when the price of almonds has dropped. So we will be rationalizing where we go with our bees," said Cummings, who farms almonds in Chico and is co-owner of a full-service beekeeping operation. "We will be fallowing some other crops to direct water to almonds and perhaps abandoning almond orchards." As a result, he said he believes many growers may reduce the amount of honeybee colonies that they place into the orchards for pollination during bloom, to save money. And all this is happening right now. 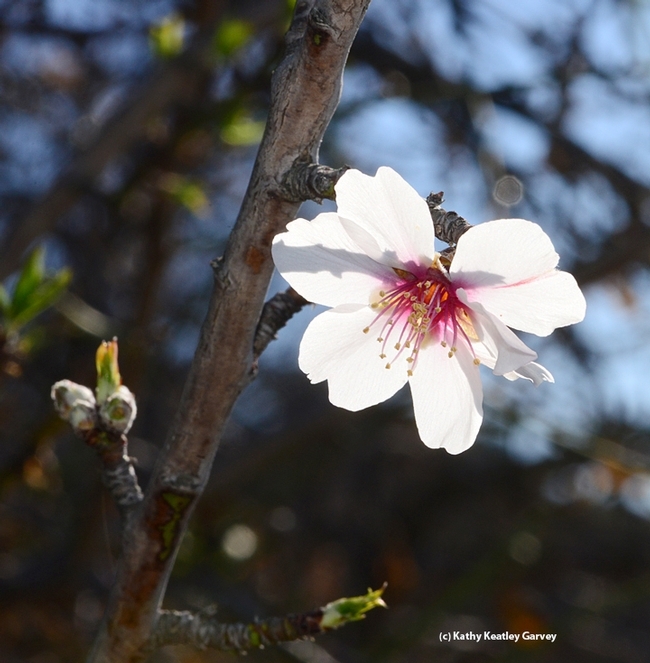 We saw the first almond blossoms this week in Yolo and Solano counties, a sure sign that spring can't be far behind. Mussen told Souza that beekeepers are most concerned about the health of their bees, "whether they operate one colony in the backyard or thousands of colonies throughout the country." "Money is important," Mussen told her, "because it costs nearly $150 to keep a commercial colony alive and productive over a year. Without that income the bees would be lost and the beekeeper would be out of business." Get ready for the bumpy ride. Take a deep breath. And, as the bumpersticker says: Get in, sit down, and hold on tight. This may be like Disneyland's Big Thunder rollercoaster that twists through mine shafts, bat caves and caverns. And watch for the falling rocks.